Even arthouse cinemas rarely bother to take the pulse of Hungarian filmmaking, but Ferenc Török's adaptation of Gábor T Szántó's short story arrives on UK screens for several good reasons. 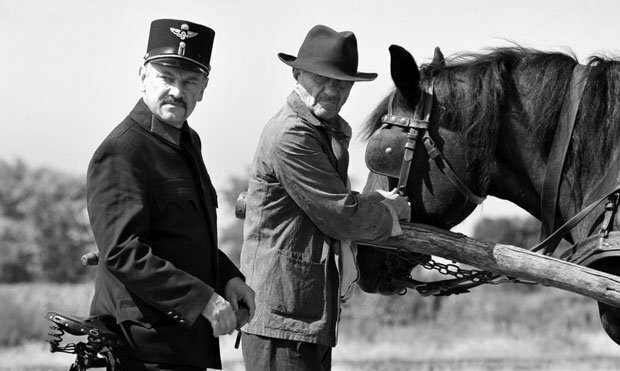 Recent Polish hit Cold War offered monochrome photography of similarly historical subjects, and Török's film shares DNA with 1950s westerns – visually with Fred Zinnemann's High Noon and thematically with John Sturges's Bad Day at Black Rock. But it's the original slant that 1945 offers on the Holocaust that makes it essential, if bleak viewing. Two Orthodox Jews (Iván Angelusz and Marcell Nagy) arrive in a small Hungarian town as World War II ends. News travels fast, and plans for the wedding of the town clerk's son are interrupted. The two perfumed cases brought by the strangers on their wagon are a point of interest and, when the townspeople fear that their way of life is about to be disrupted, they are wise to harbour anxieties. To give away the secret would spoil the impact of Török's film; it's enough to say that the punch-line is, by David Mamet's suggested rule of drama, both surprising and inevitable. Török's focus is not on any individual amongst the villagers, instead he clinically depicts the behaviour of the social entity – as threatening, guilty feelings are stirred within a wide range of firmly drawn archetypes. The grasping nature of certain characters (the wedding is less about romance than a desired inheritance of a lucrative drugstore) results in the filmmakers unflinchingly identifying the cause of anti-Semitism as personal greed. 1945's story could have been told at any point in the last 70 years; that it should feel so relevant in 2018 shames everyone who imagined that progress might have moved us away from such inhumanity. Selected release from Fri 12 Oct.